This post was originally published February 1, 2015. I have been sick the last few days. I stayed home from work on Friday because I felt so bad, and will be home again tomorrow because I feel so bad. But Saturday, for some reason, I didn’t feel so bad, so I did a couple of things around the house, and ran a few errands, which I will tell you ALL ABOUT in a moment, and consequently made myself sicker. I am completely unable to take it easy any time I am home, even when I am sick, unless I am so out of it that I can’t get out of bed. On Friday, I was running a temperature and miserable, so I sat on the sofa watching “Friends” on Netflix, sniffling and coughing, and knitting on the sleeve of a sweater than I am making. When I got bored with the sweater, I decided to take the opportunity to e-file our taxes. Yes, that is correct, I did our taxes while running a fever. Because Steve is a student, we will be gettting a very generous return, which we will use to get new glasses and running shoes, a laptop for Steve to use for school, and pay off a bunch of credit cards (yeah!). Once the taxes were done, I decided that since I had the laptop out, I would go ahead and place an order with Bramble Berry for my soap making supplies (I recently decided that I wanted to try my hand at making our own soap). Feeling satisfied with accomplishing so much in spite of all the dripping and moaning, I spent the evening being super-lazy. On Saturday, Steve and Dharma went to a Girl Scout Father-Daughter bowling event. Girl Scouts paid part of the cost, and a snack was included, so it was a nice, inexpensive way for them to spend the afternoon together. I had the house all to myself, which is very rare. Even though it was partly sunny and would have been a great day to do laundry and hang it on the line, we were out of laundry detergent, so I didn’t get to do laundry (waaah). I had also planned to go for a nice long run, but since I am sick, that obviously didn’t happen either. Since there is no way we can afford to go to Washington, D.C. again this year for the Cherry Blossom 10 Mile Run, I was planning on doing my own anniversary 10-miler on the day of this year’s race. I had planned to kick off my training this weekend, but … sick! Anyway, rather than taking it easy, since I have been sick, which would have been the smart thing to do, I decided to put my canning supplies that I rescued from under the sink into the cabinet above the refrigerator. I only use them about once a year, so this cabinet is a good place for them, since it is hard to get to without getting out the stepladder. When I climbed up the stepladder to get to the cabinet, I saw that the top of the fridge was really super dirty. So I pulled out that industrial-size bottle of Mr. Clean that I found under the sink and started cleaning. I finally opened the cabinet, which I don’t think we have opened in years, and found some antique dishes, and old phone with missing parts, and some walkie-talkies (what? why?). I tossed the phone (since it was missing the actual part that you talk into), put the walkie-talkies into a bag to give to some friends, cleaned out the cabinet, and returned the antique dishes to it. Then, I put all my canning jars and supplies into the cabinet. 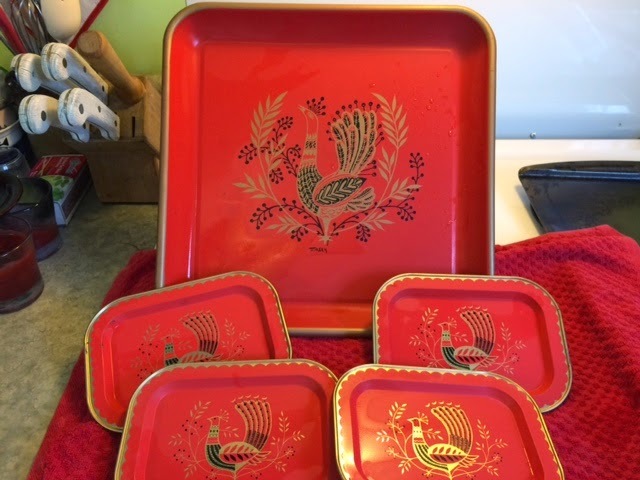 I also located my Christmas cookie cutters and put them in the cabinet as well. 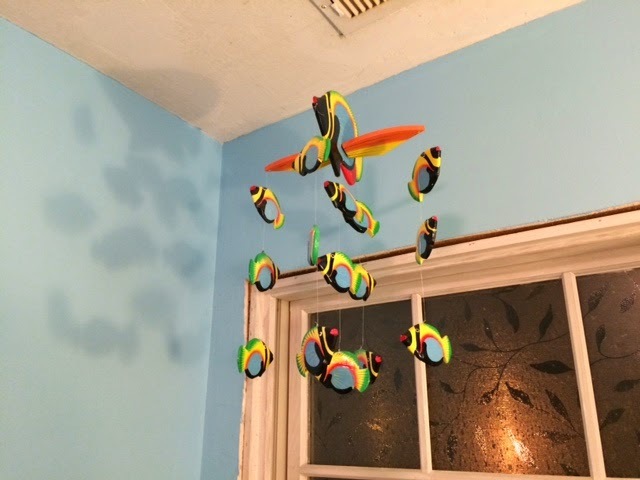 and a cool wooden fish mobile, which I cleaned up and hung upstairs in the bathroom for the time being. After the cleaning spree, I heated up some bean soup for lunch. This is the same bean soup that I made last Sunday. It has gotten yummier as the week has gone along. I also used the tortilla chip pieces in the bottom of the bag to make mini-nachos to go along with my bean soup. It was tasty, and perfect for someone who has a cold – warm and soothing. Then, I spent a little time playing with my kitty Fifi. Bridget, another of our kitties, joined in as well. Last week, Steve did some cleaning in the attic and threw out a cat bed belonging to our kitty Allister who died a few years ago. The bed was dirty from being in the attic, and had a tear in in, but otherwise was in great shape. I pulled it out of the trash, and washed it and hung it on the line to dry. Then, I got out my sewing kit to mend the tear. Before I even finished mending it, Bridget had jumped into the bed, curled up and gone to sleep. I had to sew very carefully to avoid sticking the sleeping kitty! When Steve came downstairs, I pointed to Bridget and said, “And you were going to get rid of this!”. This story doesn’t really have anything to do with me playing with the kitties on Saturday, except to illustrate how cute they are! When Dharma and Steve got home, Dharma and I loaded up the car with donations for Goodwill. I had several errands I wanted to run while we were out. First we stopped at Plato’s Closet. Dharma had an LL Bean backpack that she wanted to see if they were interested in. As it turns out, they only purchase backpacks around back-to-school time. We looked around the store anyway, and Dharma found a shirt that she liked for $8. After Plato’s Closet, we went over to Goodwill, where we dropped off the donations, including the backpack. Then, we went inside to do a little shopping. I was looking for a Pyrex measuring cup to use for my soap-making adventures. Alas, I did not find one, but I did find a great pale pink J Crew pullover sweater. It was 100% cotton which is my favorite, because it doesn’t get too stuffy, and all it needed was some laundering. And the best part was that it was $6. J Crew sweaters that I have seen online start around $60 and go up from there, so the pink sweater came home with me! After Goodwill, we went across the street to JoAnn Fabrics. I wanted to get some paper for my running scrapbook. (I like to scrapbook all my running bibs along with pictures from the races and events that I do.) They were having a 40% off sale on scrapbook supplies, so I selected the paper that I wanted, then headed over to the yarn. I wanted to get three skeins of 100% wool yarn to make wool balls for the dryer. (I also need a pair of pantyhose for this project, which I never buy, but I rescued a Halloween pair that Dharma was donating to Goodwill.) The yarn was not on sale, but I had FOUR 50% off one regular priced item coupons. I was able to use three of the coupons for the yarn, and I gave the last one to Dharma for a necklace that she liked. She used her own money, and learned the lesson of how there is more money left at the end of a transaction when you have a coupon. After JoAnn, we went to J.C. Penney’s. Dharma has a store credit that she got from returning some Christmas presents that didn’t fit. She wanted to look for shoes to go with her spring “piano recital” dress. She has learned that when she uses her own money for clothes, I am somewhat more lenient with what styles she can purchase. They didn’t really have any spring shoes in yet, but she talked me into wandering down to the juniors area. By this time, I was pretty tired and cranky. After five minutes of aimless browsing, I announced that we needed to go. The last stop of the day was at Rite Aid. I had a fistful of coupons for body wash, shampoo, conditioner, and hair color. I was particularly jazzed about the hair color coupons. I had a $2 manufacturer’s coupon, a $1 off store coupon, and another $2 rewards coupon, so I got $5 off the box of hair color. With the other coupons, I saved a total of $11.27. I also got some isopropyl alcohol ( for first-aid and soap-making purposes), a little spray bottle (to use with the alcohol for soap making), and some brown shoe polish to restore my awesome 14 year old brown shoes. We finally made it home, and ordered a pizza (I had some coupons). Even though the pizza was more than I would have liked, Steve picked it up so we didn’t pay for delivery, and I got 25 points on my deals account, which means I can get a free pizza later this month. The day did not end on a high note though. I put my new J Crew sweater in the wash, and moved the clean wet clothes that were in the washer to the dryer. I turned the dryer on, and it said, “Click!” and nothing happened. That means that the fuse has blown AGAIN. The last time we replaced it, I was going to order some more, but I forgot, so we have no fuses. This means we have no dryer for at least a week! Of course, the weather has now changed, so I won’t be able to hang clothes on the line either! I was able to go to Amazon and immediately order some more fuses, but of course it will take a week for them to get here. I also ordered some A/C filters while I was there (as I can get them in bulk and they are cheaper), and a Pyrex measuring cup, so I guess all wasn’t lost. All in all, it was a very productive Saturday. Of course, I am paying for it today, because I overdid it and now feel horrible! And probably no one cares about all the boring things that I did over the weekend, but decluttering, simplifying, and living and shopping frugally are all new and novel concepts for me!